Guest blogger Anne Gore Galegor, Political Military Planner, Joint Enabling Capabilities Command, U.S. Joint Forces Command, recounts her recent visit to the landscape of the Battle of the Bulge. Driving into Bastogne, the homes and farms are placed in nothing less than a fairytale setting. Most homes are “older” (1950s due to the bombing during World War II) concrete block homes with beautiful rock facades. Arranged around the homes are large meticulously landscaped gardens with shrubbery and flowers and small grass lawns. Any large stretches of open landscape are used as pasture for cattle and sheep. Every so often a random white birch or fir tree breaks the rolling landscape, and in all its pastoral serenity, it is hard to believe this dreamy rural area was the place of one of the bloodiest battles of World War II. Though nearly 70 years separate us from the Battle of the Bulge, the people of Bastogne continue to commemorate the sacrifice of the Allies to hold fast and save their town. Upon arriving in the historic town center, our first exposure to anything reminiscent of war is the American tank perched in front of the visitor’s center, pointing its barrel toward the American monument. We headed straight for the trail to the memorial, a large star-shaped structure commemorating the forty-seven American states that conscripted their sons (and daughters) to fight the tyranny of the Nazi regime. 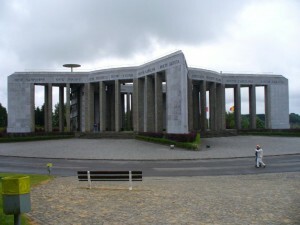 The memorial from the people of Bastogne is a gift and long-lasting thank you to the people of the United States for saving their town from the grip of German forces. The adjacent visitor’s center is filled with uniforms, weapons and supplies with a self-guided walking tour ending with a video, well worth the 8 Euro to gain admittance. We drove back into the center of town for lunch. The streets are lined with patisseries, boulangeries, and boutique shops. A quaint small town that still loves America. Where a Belgium flag flies, a U.S. flag is right beside it. We had lunch at the Leo Restaurant, a perfect balance of casual elegance with a highly motivated staff and delicious food. We all enjoyed white wine and Juliper Beer, steaks, hearty bread, and creme’ brulee’. For the first time since high school, I was forced to speak French, and I performed adequately, getting exactly what I ordered, prepared perfectly. 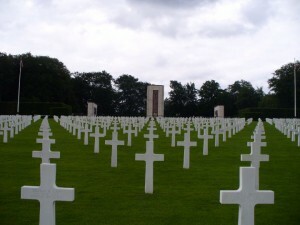 Our last objective of the day was visiting the American Cemetery in Luxemburg. Walking in the gates, it was clear this is a graciously preserved memorial to the American sacrifices during World War II. Standing at the top of the burial grounds, the design is striking: not one headstone hides another. You can literally see every marker, represented by a cross or Star of David. Of the over 5,000 soldiers and one nurse buried in this cemetery, most were victims of the Battle of Bastogne. This is also where General George S. Patton is buried; his final wish was to be buried with his men from the Battle of Bastogne. His grave stands at the top of the cemetery, symbolizing Patton leading his army even in death.